When some no-limit hold'em players think of "trapping" they immediately think of "slow playing." In fact, some will equate the two, mistakenly believing the only way to trap an opponent after the flop is by slow playing. Trapping actually refers to a broader postflop strategy that can but doesn't necessarily involve slow playing. You can "trap" and still play a hand "fast" by betting and raising right away for value. We're all familiar with slow playing, a strategy that can work especially well in certain situations, particularly against aggressive opponents. It's kind of the opposite of bluffing. Instead of betting with a weak hand, you check or call with a strong hand, giving the impression from your action that you are weak. 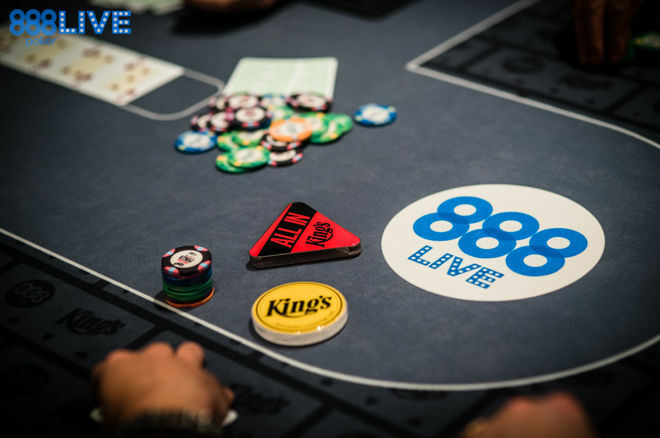 Earlier this week, Matthew Pitt recounted "The Top 5 Hands from 888Live Rozvadov," one of which provides a ready example of someone slow playing a strong hand in order to earn maximum value. With eight players remaining in the €5,300 High Roller, Enzo Del Piero raised with and was called by Pierre Neuville from the blinds who had . The flop fell to give Neuville trips, and rather than leading with a bet he chose to check and allow the preflop raiser to continuation bet, as Del Piero did. Neuville just called the c-bet, and checked again after the very safe-looking turn card fell, remaning reasonably sure his trip nines remained the best hand. Del Piero checked behind this time, and the river brought the . With other river cards Neuville might have chosen this as a time finally to bet his hand. But he knew the ace was likely either to have improved Del Piero to a good but in this case second-best hand, or if it didn't improve him the card might encourage Del Piero to bluff and represent having an ace in his hand. Neuville therefore checked again, and Del Piero fell into the trap by moving all in. Neuville called right away to win the pot and eliminate Del Piero in eighth. While that was certainly an example of slow playing, Neuville's call of a raise with more generally illustrates a key principle of "trapping" — namely, playing a speculative hand and then finding a way to earn full value when the hand manages to hit the board hard. Such examples of trapping can begin in various ways. A player might choose to open-raise before the flop with — a "suited one-gapper" with potential to flop flush or straight draws. Suited connectors (e.g., , , etc.) and small pairs also qualify as speculative hands that need to improve postflop to outperform stronger starting hands. When such hands do improve, the likelihood of their earning value increases since opponents often think first of stronger starting hands when others raise preflop. Especially if you've cultivated a somewhat tight image, if you raise with and a flop comes , your opponent won't necessarily appreciate how hard that flop has hit your hand (giving you both straight and flush draws). Or if you raise with and a flop comes — a board that looks like a big whiff to a preflop raiser holding a couple of Broadway cards. In such cases, continuation bets are more likely to be called, as might turn and/or river bets as you seek even more value. The "trap" here is achieved not by slow playing, but rather by betting and/or raising throughout. A hand like this can prove beneficial in other ways, too, favorably affecting your image. You raised with six-five then barreled away postflop? Some opponents won't appreciate how those later bets were for value, instead remembering what seemed a very loose preflop play. You might actually be on the tight side, but now you appear loose, and thus are set up well to earn action when raising with genuinely strong starting hands. Going ahead and betting after flopping a set with a small pocket pair is another way potentially to trap an opponent into paying you off. You have and the flop comes . In some cases slow playing might be the right option, but in others going ahead and betting will be even more deceptive and thus a more effective "trap" in which to ensnare an opponent. However it is achieved, trapping means underrepresenting the strength of your hand in order to encourage opponents to commit chips when you have them beat. But slow playing — that is, checking and calling — isn't the only way to underrepresent a hand. Betting can also connote weakness, in certain situations, and thus deliver the signal that you're not nearly as strong as you are. Continuation betting "dry" flops that appear unlikely to have hit the hand you raised with before the flop is one example. So, too, might "donk betting" — leading with a bet from out of position after calling a preflop raise — on a "wet" flop that happened to have hit your hand hard. Even a postflop check-raise, usually a very aggressive move signaling obvious strength, can in certain, special situations be regarded as suggesting weakness, interpreted as a bluff rather than appreciated for a genuine attempt to build a pot. Slow playing can be an effective way to win big pots, especially against aggressive opponents. But remember there are other ways to trap, too, including by going ahead and betting strong hands yourself in situations where your bets might appear more like bluffs than for value.